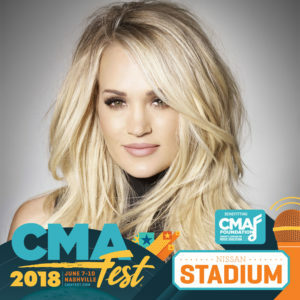 Share your favorite CMA Fest memory for a chance to win two (2) 4-day passes to the stadium shows at CMA Fest in Nashville, TN on June 7-10. Thank you for all your submissions! Check out the Care Bear Game Day Digital Cookbook below to find a new snack recipe for the game this Sunday! It includes over 20 recipes submitted by fellow fan club members. Fan Club Black Friday through Cyber Monday offer! Save extra in the Official Carrie Underwood Store this Black Friday through Cyber Monday! Announcing the Carrie-inspired Summertime Playlist Contest! Submit your summertime playlist and you could win! Video highlights from the 2017 Official Fan Club Party! Check out highlights from this year’s Official Fan Club Party! Nashville – June 6, 2017 – Grand Ole Opry member and seven-time GRAMMY®-winning superstar Carrie Underwood hosted a party for her official fan club at the Grand Ole Opry House today. The exclusive event for fan club members included a private performance, a raffle for prizes, and a photo with Carrie inside the Opry’s famed circle of wood. Fans were given Nashville Predators’ rally towels and celebrated last night’s win in a group photo with Carrie. Tonight Carrie will perform during two Grand Ole Opry shows. Care Bears — here is a clip of the new “Dirty Laundry” video, exclusively for fan club members, that will premiere on Entertainment Tonight tomorrow, Oct. 12. Following the premiere (check local listings), the full video will be available at ETonline.com. Also, be sure to check out tonight’s episode of Entertainment Tonight for a look behind the scenes of the video shoot.